Healing Vedic Astrology Gemstones White Sapphire, The White Sapphire also referred to as the colorless Sapphire is the Gemstone of Venus as per Vedic Astrology. 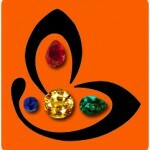 A powerful gemstone it is the best alternative to Diamond and is considered as an Uparatna for Venus. Venus represents luxury, beauty, good fortune, fine things in life, riches. It is a strongly posited planet for actors, artists, performers, singer and those involved in creative pursuits. 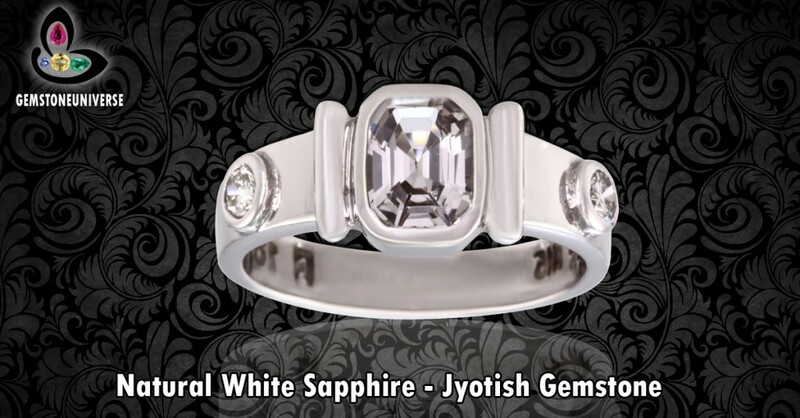 To Buy White Sapphire Gemstones online know the white sapphire stone Price benefits in vedic astrology. The colour wave transmitted by a White Sapphire Gemstone is indigo. This soothing color wave directly impacts the water system of the body especially mucous and the sperm. This indigo Colored wave transmitted by the white sapphire provides energy, vigour, vitality, ability of the body to heal & most importantly youth. It is an excellent Gemstone for balancing the hormone system and blesses it wearer with clarity of thought and a serene pure mind. Selected Rings, Pendants and Talismans made available to Gemstoneuniverse.com patrons in April 2014. Comments Like the sparkling waters of a mountain stream – Clear, super lustrous and flawless. Behold this absolutely stunning rare white sapphire Gemstone Price in India, Sri Lanka. Colorless corundum at its best! This White Sapphire ring from the new lot Vajra is a beauty that also has a superb weight (mind you a rare gem that is fully natural and radiation free catapults it into the super premium category), making it the perfect medium for harnessing rich, harmonious and powerful Shukra/ Venus energies. Beautiful talisman with this gem set in white gold, is what can beget you the best from the planet of love, sensuality, beauty and luxury – Venus. The power of Venus gets boosted with the additional use of Diamonds as accent gemstones. A powerful Venus Talisman for powerful Venus results.To view this White Sapphire Gemstone before it was set please click here.Note: The above links generally exist on the website for a period of 40 days after which they are periodically deleted to make way for new gemstones and to enable faster browsing.